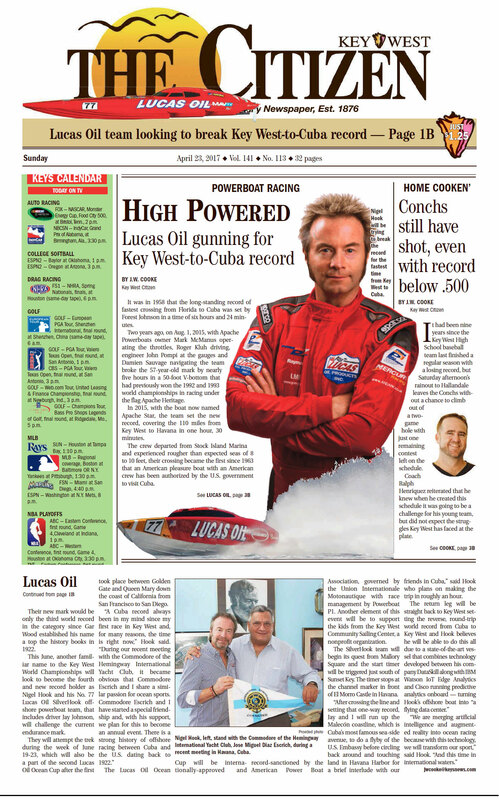 Nigel Hook’s #77 Lucas Oil SilverHook race boat, is already a premiere showcase of technology, but now his team is planning to incorporate BGAN (Broadband Global Area Network) for transmitting engine data, heart rate, and the cockpit audio during their upcoming world speed record – The 2017 Lucas Oil Ocean Cup - Key West to Cuba (and back). The timeline to fully integrate and test out the BGAN solution has resulted in a date shift of the world speed record which is now scheduled for August 17, 2017. It was during an in depth planning session that Hook’s communications and integration team, Duchancell Engineering, made the decision to augment the boat’s technology and use BGAN for the voice and data transmissions between Key West and Cuba allowing for the constant tracking and connectivity between the pilots, the Agusta 109C safety helicopter, and the support boats. 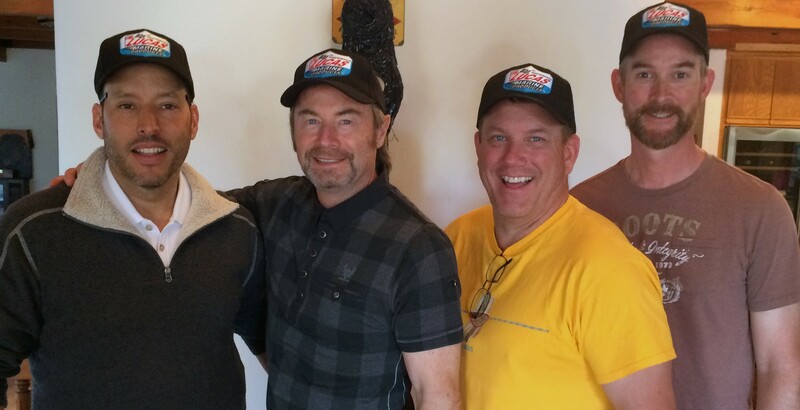 Fernando Cancel, Nigel Hook, Dave Heronemus, and Chip Robertson. Lucas Oil is the leading producer of high performance lubricants! Lucas Oil - Made in America and Sold to the World! SilverHook® Powerboats is the most exclusive and technically advanced offshore monohull in the world. With lines echoing the iconic XKE that Enzo Ferrari said was the most beautiful car ever made! 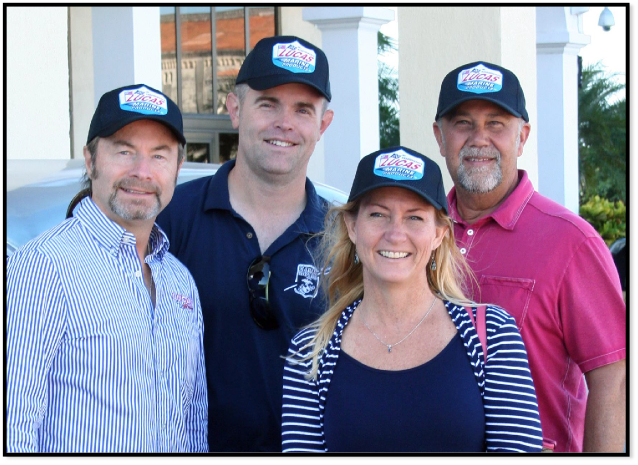 The SilverHook Record mission has captured the imagination of the residents of the Florida Keys with the attempt being featured on the front page of the Key West Citizen (http://keysnews.com). Click on the image to read the article in full. At the 2017 IBM Interconnect Conference session, “Driving Intelligence to the Edge in Powerboat Racing with Watson IoT Edge Analytics” presented by IBM’s Tom Sarasin and DataSkill’s CEO Nigel Hook, Hook switched hats by putting on his [virtual] crash helmet and announcing that this June, his offshore powerboat team and driver, Jay Johnson, will challenge the current endurance world record from Key West to Cuba and that they will also set a new, round trip world record in Hook’s #77 Lucas Oil SilverHook. 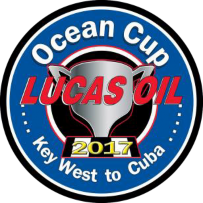 This record, the Lucas Oil Ocean Cup – Key West to Cuba, will be the second Ocean Cup presented by Lucas Oil, the first established in 2013 as the Lucas Oil Ocean Cup – Golden Gate to Queen Mary. Pioneering data-driven, artificial intelligence systems and racing offshore powerboats have been Nigel Hook’s passions since he was a teenager (not in that order). Hook states “We are merging artificial intelligence and augmented reality into ocean racing because with this technology, we will transform our sport. And this time in international waters!” The technology developed by DataSkill with IBM Watson IoT (Internet of Things) and Cisco, runs predictive analytics onboard the boat turning Hook’s offshore boat into a flying data center. 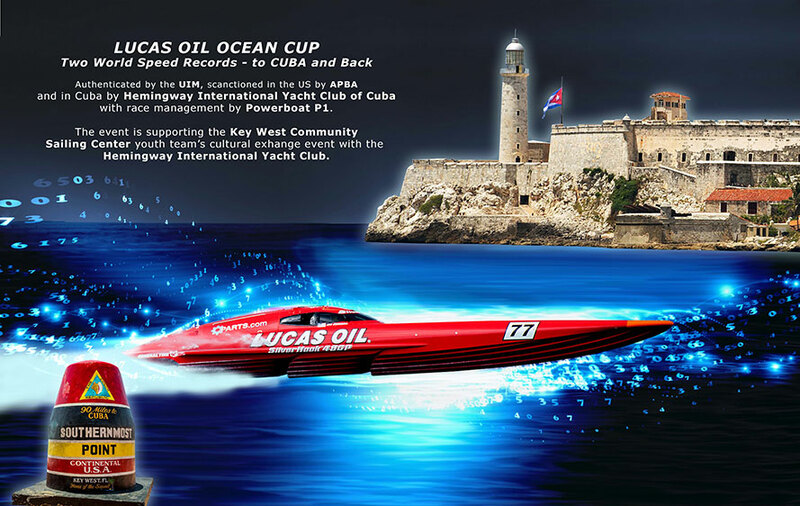 This Lucas Oil Ocean Cup – Key West to Cuba record, scheduled for the week of June 19-23, will be an internationally approved record sanctioned by the American Power Boat Association (APBA), governed by the Union Internationale Motonautique (UIM) with race management by Powerboat P1. Another element of this event will be to support the kids from the Key West Community Sailing Center, a non-profit organization. The speed record will begin in Mallory Square (Key West) and the start timer will be triggered just south of Sunset Key. The timer stops at the channel marker in front of El Morro Castle Havana, Cuba (Castillo de los Tres Reyes Magos del Morro). Hook says "After crossing the line and setting that one-way record, Jay and I will run up the Malecón coastline which is Cuba’s most famous sea-side avenue, to do a flyby of the US Embassy before circling back around and touching land in Havana Harbor for a brief interlude with our friends in Cuba!” The return leg will be straight back to Key West setting the reverse, round trip world record from Cuba to Key West. 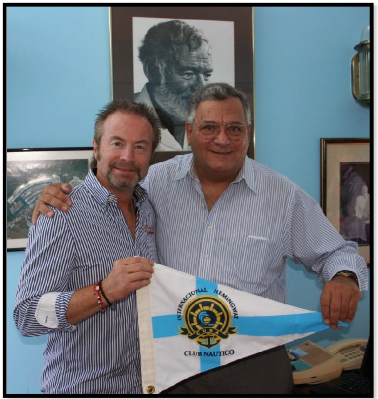 Event Director, Karen Angle, joined Hook and Johnson on their recent reconnaissance mission where she introduced them to Commander Derek Cromwell, Coast Guard Liaison to the United States Embassy La Habana, Cuba. The meeting with Commander Cromwell provided important insight into the logistical planning of this event. Copyright © 2018 SilverHook®Powerboats LLC. All rights reserved.